Organized at Lafayette, Ind., and mustered in at Indianapolis, Ind., March 24, 1862. Left State for Washington, D.C., June 1. Duty at Capital Hill until June 26. Attached to Military District of Washington, D. C., June, 1862. Artillery, 2nd Army Corps, Army of Virginia, to September, 1862. Artillery, 2nd Division, 12th Army Corps, Army of the Potomac, to October, 1862. Artillery, 2nd Brigade, Defenses North of the Potomac, Defenses of Washington, D.C., to February, 1863. Fort Washington, Defenses of Washington, North of the Potomac, 22nd Army Corps, to May, 1864. 2nd Brigade, DeRussy's Division, 22nd Army Corps, to July, 1864. 3rd Brigade, DeRussy's Division, 22nd Army Corps, to December, 1864. 1st Brigade, DeRussy's Division, 22nd Army Corps, to July, 1865.E.--Ordered to join Banks in the Shenandoah Valley June 26, 1862. Pope's Campaign in Northern Virginia July to September. Battle of Cedar Mountain August 9. Fords of the Rappahannock August 21-23. Battles of Groveton August 29 and Bull Run August 30. Maryland Campaign September 6-22. Battle of Antietam, Md., September 16-17 (Reserve). Ordered to Washington, D.C., and duty in the Defenses of that city North and South of the Potomac until June, 1865. 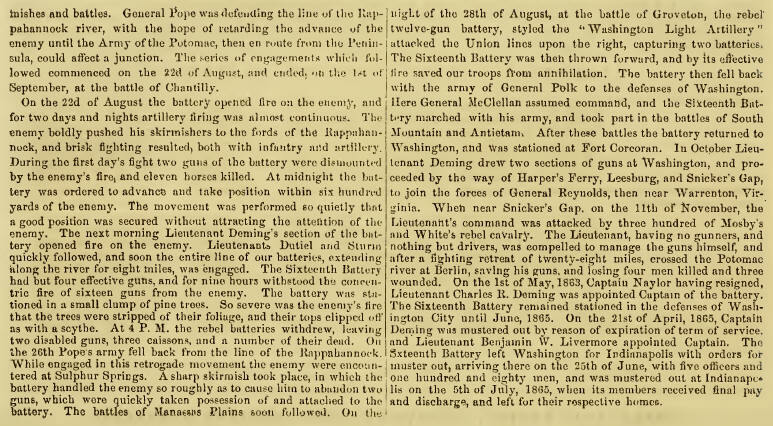 Repulse of Early's attack on Washington July 11-12, 1864. Ordered to Indianapolis, Ind., June, 1865, and there mustered out July 5, 1865.